Though it has suffered through countless shallow adaptations in popular media and been tarnished by associations with backward and twisted ideologies, Norse mythology still inspires me. The tales of the Prose and Poetic Eddas continue to resonate with a kind of primordial magic, and dark chronicles of doomed gods subvert the cheap heroic fantasy we’ve all grown far too accustomed to. Still, virtually every comic, film and song on the subject seems intent on depicting the pre-Ragnarok state of the gods, still agleam in all their glory. As beautiful paragons of a strangely western sense of morality and justice, they battle back their hopeless, inevitable fates, satisfying that little shred of humanity that hopes to upset the dire designs of destiny. Nowadays, all we seem to see is the surface gleam of ancient heroes, rather than the deep flaws and peripeteia that darken them, making them true reflections of the all-too-human minds which spawned them. Ragnarok: Last God Standing, thankfully, is not that story. The world was ripped apart by Ragnarok in a time before remembering. The Aesir and Vanir perished beneath the bared fangs and bloody blades of their enemies. Hel has opened her gates and Naglfar has spewed forth armies of the risen dead. The world-serpent Jormugandr spewed its poison across the land, and Surtr and the sons of Muspelheim have declared their victory over the now-dead gods. Mortals now contend with the inhuman designs of dark elves, trolls, draugr and dwarves, struggling to persist in an age of perpetual twilight. Midgard is not dying—it is a corpse, and those trapped in its still-rotting heart are naught but the damned and those violent enough to eke out some kind of bitter existence in the ashes. Yet, at the fortress at the edge of the world, a long-dormant god stirs, awakened in a flurry of violence and godly might. None other than Thor, risen from the dead, rises from his tomb, eager to learn the fate of his kinsfolk and riding forth to exact his undead vengeance. Ragnarok: Last God Standing follows a lot of familiar beats: The hero rises from the grave, seeking to piece together the shreds of their former life. The forces of darkness conspire to return them to oblivion. Old enemies return, grudges are laid to rest, and villages of cringing peasantry are saved. Yet, there’s an undeniable style and sincerity to this tale, one which pulls equally from Walter Simonson’s abundant legacy of old-school comics and the real substance of Norse mythology. Now, that’s not to say this is a beat-for-beat recreation of the world envisioned by medieval norsemen. If you’re looking for accuracy, you’re better off picking up Snorri Sturulson than a comic book. Ragnarok: Last God Standing is, rather, an abundantly entertaining extrapolation of Norse myth with smatterings of sci-fi and some gloriously cheesy action. However, that doomed, hopeless spirit of Norse mythology remains truly alive, intermingled with the corrupted heroism of everyone’s favorite God of Thunder. While Simonson’s definitely got a history with Thor—having been the major architect behind his resurgence as a major Marvel hero—this version of the hero is thoroughly damned. This Thor bears none of the Marvel interpretation’s superheroic tendencies, and though he emerges from the same pen, his motivations, personality and aesthetic are entirely unique. 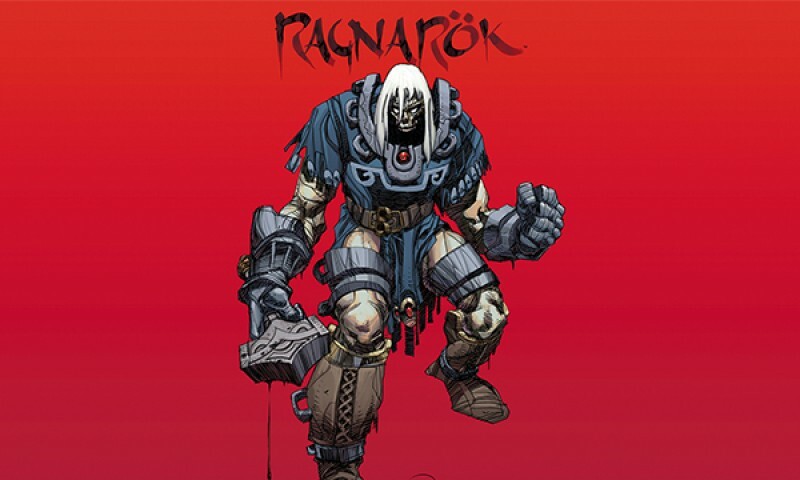 Ragnarok: Last God Standing gives Simonson the license to immerse this tragic hero into a world steeped in the true substance of myth. Without the shackles of the Marvel universe holding it in check, this feels like the strongest of his Asgardian tales. What’s more, both Thor and the forces aligned against him are fully fleshed-out characters with meaningful backstories and complex motivations. It’s telling that, in the first leg of the story, I was rooting full-heartedly for Brynja, despite what the success of her mission would mean for the story. Similarly, Thor’s first waking thoughts are cast to his long-dead family, but he’s not the shining, virtuous knight you’d expect. He’s got much more of an Akira Kurosawa samurai bent to his character, where honor is more of a reflex and compulsion than a moral obligation. He’s still a god, and the mortals he protects are little more than insects underfoot, but they’re his insects to save. It’s nice to see Norse mythology source material with some actual strength of characterization, and while some familiar figures like Surtr still act like mustache-twirling villains, it feels as though that particular brand of evil is theirs alone. Simonson’s art is truly noteworthy here. Ragnarok: Last God Standing bears his familiar balance of sci-fi designs and fantastic , a strong color palette and rough, uncompromising line work. Thor’s undead mug is withered and desiccated, but has enough gentleness around the eyes that he never appears truly monstrous. The action scenes are grandiose and colorful, and while they’re not dripping with innovative choreography, there is an evident and inescapable sense of power about Thor’s character. There is a strong visual aesthetic throughout that brings out equal parts gritty, post-apocalyptic darkness and antediluvian splendor. Simonson has long since earned his place as a classic comicwright, but Ragnarok: Last God Standing is a splendid step forward, a rarity after such a long and storied career. Truth be told, this comic isn’t a triumph of storytelling or a daring entry into the annals of comic literature. It’s a solid, if somewhat formulaic tale that isn’t afraid to get into the true spirit of Norse myth, but boldly advances beyond it in the quest to continue a story thought long-finished. The action is worth it alone, and the sheer inventiveness Simonson discovers within the bounds of tradition and myth are consistently satisfying and impressive. I’m just happy to read through a comic that so easily speaks the language of Norse gods without feeling enslaved by it. 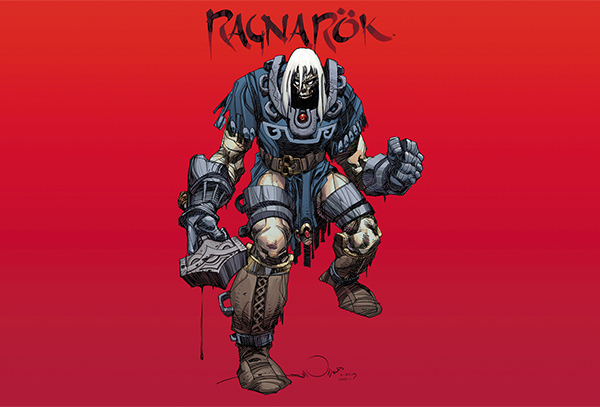 Simonson has managed to achieve a rare creative freedom with a traditional take on the hero he helped to establish in the world of comics, and Ragnarok: Last God Standing sees him at peak form. I’m sincerely interested in continuing this series, and I trust Simonson to keep delivering what he always has—top-notch, good old-fashioned comic book mastery.